Mercedes-Benz just gave us a glimpse of the future of urban transportation with its new self-driving bus. The semi-autonomous Future Bus is a much safer bus that is also more efficient and more comfortable than today’s conventional buses. Thanks to several cameras and radar systems, the semi-automated city bus relieves the driver’s workload, while its predictive driving style saves wear and tear while lowering fuel consumption and emissions. 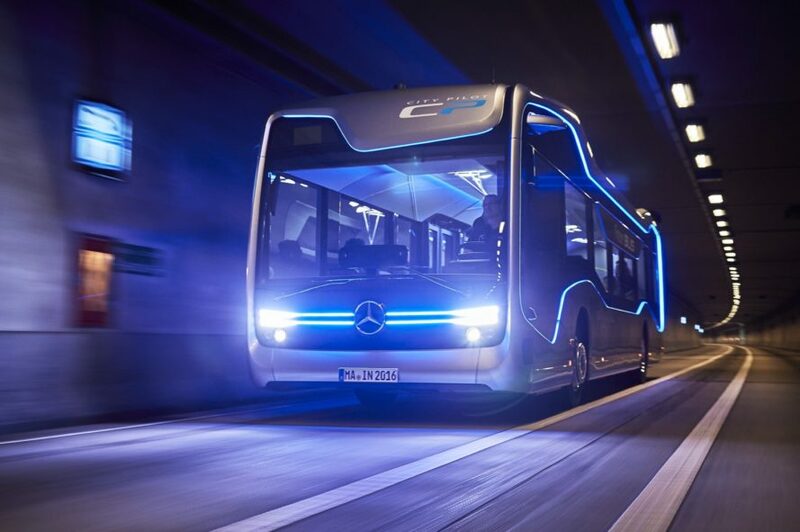 The Mercedes-Benz Future Bus utilizes autonomous CityPilot technology that was originally introduced in the self-driving Actros truck that the automaker presented two years ago. Mercedes-Benz says that the technology has been further developed for the Future Bus with several functions. Thanks to a dozen cameras combined with long and short-range radar systems, the CityPilot technology is able to recognize traffic lights, communicate with them and safely negotiate junctions controlled by them. It can also detect obstacles, like pedestrians, on the road and automatically stop on its own. The Future Bus also approaches bus stops automatically, where it opens and closes its doors. To demonstrate the technology Mercedes-Benz has established a 12-mile track where the Future Bus is able to drive on its own with a number of tight bends, tunnels, numerous bus stops and some high speed sections. 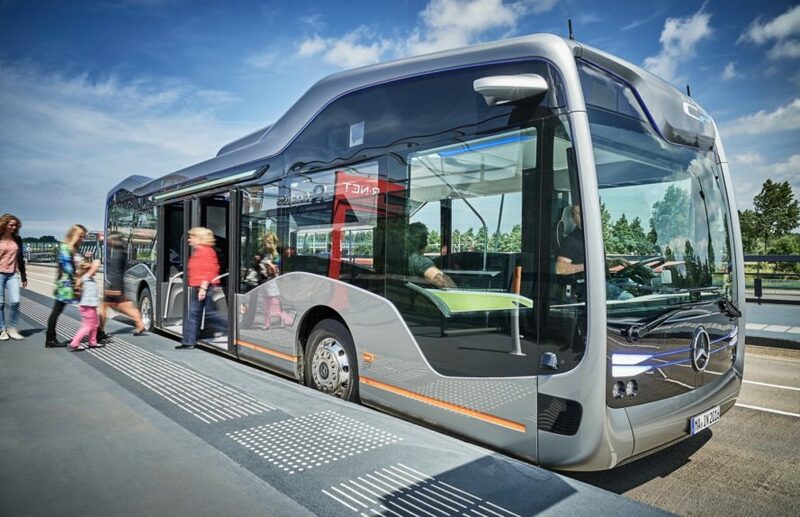 The Mercedes-Benz Future Bus with CityPilot will be making its first public journey on part of Europe’s longest BRT route (BRT = Bus Rapid Transit) in the Netherlands. The route links Amsterdam’s Schiphol airport with the town of Haarlem. Where do the bicyces go? Mercedes-Benz is previewing the future of urban transportation with the reveal of its new self-driving Future Bus with CityPilot concept. Mercedes-Benz just gave us a glimpse of the future of urban transportation with its new self-driving bus. The semi-autonomous Future Bus is a much safer bus that is also more efficient and more comfortable than today's conventional buses. Thanks to several cameras and radar systems, the semi-automated city bus relieves the driver's workload, while its predictive driving style saves wear and tear while lowering fuel consumption and emissions.